My card was made using a fabulous image, garden faery, from the very talented CJ, for more designs like this visit Cowgirl Up Designs. The sketch was from 2 sketches 4 You. I used the papers from a couple of CC CD roms, Mrs Tiggywinkle & Summer Stories. The ribbon was a RAK from Leann and I made the strawberries from fimo. I also punched the corners with the MS punch I purchased from QVC (the punches cost so much my OH says I must use them on everything, don't think it will be a problem as I absolutely love them, at the moment!!). I have put stickles on my fairies wings but it isn't showing very well on my photo (blooming rain clouds, where is the sun it's August). I coloured her with Promarkers. My inspiration for this card was the colours and I have gone for strawberries and clotted cream. MMMmmmm strawberries and clotted cream. To see the rest of the Posse's amazing work go to the buttons under my header and click. 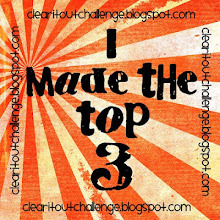 The TOP 3 badge to display on their blog. We are also look for a Guest Designer for the month of September. Just a reminder that we are having a Blog Hop on August 29th. 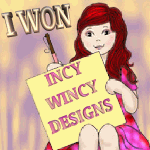 If you grab the banner from my sidebar, put it on your blog and go to Cowgirl's Sunday Stamp'en Challenge and leave a comment on the Blog Hop post there will be a prize for 1 lucky person. Oh too cute! Love the yummy strawberry buttons & the papers, so sweet! Thanks for joining us at SSC this week. This is so sweet Poppet! Thanks for joining us at Penny's. Good Luck! Its a beautiful card Poppet. Love the papers and pretty image! Sweet image, fab papers and I adore your fimo strawberries, just perfect! Sweet card! I love the strawberries. The punches are lovely, I'd use them all the time too! Great card! Love the papers and the super cute strawberries! Thanks so much for joining us this week at Stamptacular Sunday ♥ Good luck on our Buttons & Bows challenge! Hi Poppet I love your yummy card. 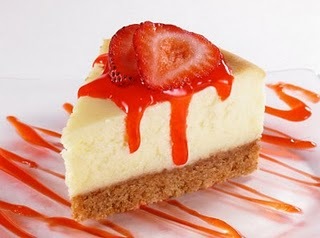 Just looking at it makes me hungry. I love how you have coloured in the image exspeasaly the beauitful red dress. What a "yummy" creation Poppet!! 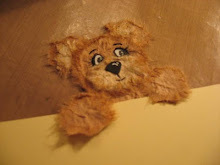 Thanks for sharing it with us at Penny's Paper-Crafty Challenge! Hope to see you again next challenge!! I love how you put the strawberry buttons over the dp...nice touch! I'm so glad you could join our Buttons and Bows Challenge this week at the Stamptacular Sunday Challenge! Today I also wanna thank you for always commenting on my Blog! =) That's so sweet of you! What a perfect way to join the challenge!! Those papers are just wonderfully matched to the inspiration photo!! Great work!